Until January 1: TOSCANA GOSPEL FESTIVAL. Various venues and times. The Tuscan Gospel Festival brings the “good news” of the holiday season to Tuscany. Deeply rooted in the African-American church tradition, gospel music fuses spiritual lyrics with jazz, blues and harmonies with melodies and sometimes rhythms brought from Africa. Traditionally gospel was performed a cappella, with hand clapping and foot stomping adding rhythm. Today the praise music is often accompanied by guitars, upbeat drums, soulful organ rifts and tambourines. Gospel groups from many parts of America invite the community to hear, see and feel their songs of praise encompassing joy and hallelujahs and the laments recounting loss and sorrow. The Tuscan Gospel Festival offers performances in medieval hilltop villages, riverside towns and the cities of Arezzo, Siena and Florence. Famous for the leather industry, Fucecchio, set on the north bank of the Arno near Empoli, offers a concert featuring Danton Whitley and Mosaic Sound. Whitley with his backup vocal group deliver uplifting music derived from their deeply spiritual roots (December 27, Fucecchio, Nuovo Teatro Pacini, 9:15 pm). The holiday spirit continues when the Earl Thomas Spiritual and Soul Christmas show comes to Florence. The City of the Renaissance, known for its history, literature, art, culture and Brunelleschi’s dome seems a perfect setting for Earl Thomas who experienced his own renaissance at the age of 22. Following a serious accident, he miraculously regained consciousness and dedicated his life to becoming a singer. With roots in southern American spirituals and blues funk Thomas has performed with B. B. King and Elvis Costello and written songs covered by Etta James (December 28, Florence, Teatro Puccini, 9 pm). Head downhill to Piazza San Francesco to the Basilica of San Francesco. This church with its simple, unadorned design holds its treasures inside. The Cappella Maggiore contains the must see 15th century fresco cycle of Piero della Francesco, the Legend of the True Cross. Featured in the film “The English Patient” the fresco sequence narrates the story of the cross upon which Christ was crucified. Viewing Della Francesco’s masterpiece of sacred art should evoke the frame of mind to appreciate the gospel music of the evening (December 29, Arezzo, Teatro Tenda, 9:15 pm). A medieval castle with its imposing tower, the Tower of Marciano, literally towers over the hilltop village of Marciano della Chiana. Built as a defensive fortress the well-preserved tower now serves as a cultural center for the town. 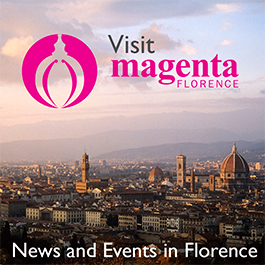 Visitors can travel back in time to August 1554 when the brutal Battle of Marciano was fought by the Florentine Medici and the rival Sienese Strozzi. A scale model of the battle with more than 1,000 soldiers in place can be seen in the tower. (www.latorredimarciano.it). 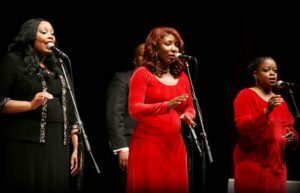 The Louisiana Gospel Psalmists, a group of six women united by their passion for gospel music, offer their message of hope and grace through song in the tower (December 30, Marciano della Chiana, Torre di Marciano, 9:15 pm). For a New Year’s Eve filled with music and inspiration San Casciano Val di Pesa has scheduled an evening with The Harlem Voices. This town just 15 km. south of Florence, inhabited since Etruscan times, possesses a rich history with records counting many churches and castles during the Middle Ages. Situated on a major road leading north to Florence and south to Rome, legions of troops and tradesmen traveled through. In July 1944 the village was nearly completely destroyed. Back in San Casciano Val d’Pesa, the music begins at 10 pm and celebrators can ring in the New Year with the rich harmonies of The Harlem Voices (December 31, San Casciano Val d’Pesa, Teatro Niccolini). On New Year’s Day, gospel performances continue in Prato, Siena and Monteriggioni. Prato is situated between the Arno River and the foot of the Calvana mountains, traditionally a center for the textile industry and more recently known for its slow food movement. Its Cathedral di Santo Stefano shelters recently restored frescoes by Filippo Lippi, a pulpit designed by Donatello and the city’s most treasured sacred relic, the belt dropped by the Virgin Mary during her assumption. The Harlem Voices sing praises to welcome in 2017 in the afternoon (January 1, Prato, Teatro Metastasio, 5 pm). Siena, with its historic center a designated World Heritage Site, offers a rich Tuscan experience for the visitor. The stunning Gothic cathedral contains priceless Renaissance art by Ghirlandaio, Donatello, Pisano and others. Inside the black and white striped marble columns lead the eye to the elaborate inlaid marble floor, with mosaics creating story masterpieces. Stroll to nearby Piazza del Campo, the shell-shaped square that’s the site of the famous Palio horse race in the summer. A visit to Siena would not be complete without entering the Palazzo Pubblico where one can view Lorenzetti’s frescoes depicting the Allegory and Effects of Good and Bad Government. The Serenity Singers, from Baltimore, Maryland, raise their passionate voices to heaven bringing inspiration and comfort to all who listen (January 1, Siena, Teatro dei Rozzi, 5 pm). For those who imagine living in the Middle Ages, a visit to Monteriggioni takes one back in time to a fully walled 13th century village with 14 intact towers. Visitors can walk on the walls, understanding its important defensive position and enjoying the sweeping landscape. Mentioned by Dante in the Divine Comedy, the town played an important role during the conflicts between Siena and Florence in the Middle Ages. The Piazza Roma contains a small museum with replicas of medieval armor and weapons and a pillory that visitors can employ for a great photo op. The Louisiana Gospel Psalmists offer their gumbo of black contemporary gospel, high praise, and spiritual music, spreading joy and inspiring faith in this historic setting (January 1, Monteriggioni, Castello Piazza Roma, 3:30 pm).